Is it wrong that I'm hoping that there will end up being five books--and that each one will have the insignia of one of the five factions? Because let's face it, I'm in love with the foiled flame on Divergent's cover (and by this, I mean that if you remove the dust jacket, it's on the actual cover). 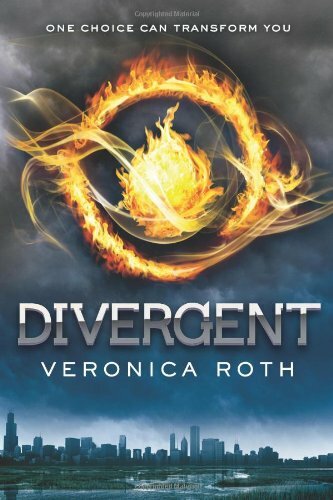 Secondly, on the off chance that you have not read Divergent yet, well, what are you waiting for? Yes, it's been compared to The Hunger Games and yes, there are some similarities there; but more importantly, it really draws you in and by the time you get to the last page, your mind will be reeling and like me, you'll be wondering when the next book in the series is coming out! Like all sixteen year olds, Beatrice Prior is given a simulation to help her pick a faction; however, unlike most sixteen year olds the results are... inconclusive. By the time her name is called at the Choosing Ceremony, Beatrice has made up her mind and picks Dauntless, a faction known for its fearless nature as well as its ruthlessness. From there, she must strive to fit in and adapt to life as a Dauntless. More importantly, she'll learn more about a particular faction than she originally knew--and it will change everything. If I could sum up Tris (Beatrice) in one word, I'd call her human and I mean this in the best possible way. She knows she doesn't fit in with Abnegation because she's not selfless but at the same time, Dauntless brings out her selflessness as well as her will to survive. She's smart and brave, but at the same time, she hesitates and sometimes regrets decisions. And the only other character you'll hear me talk about today is Four--because I thought Eric sounded like a sleaze and Peter was, well, horrid--who is a part of Dauntless and he's in charge of training the new kids. He's mysterious at first, but slowly he opens up to Tris and I refuse to tell you more than this, because you'll learn a lot more about him as the plot unfurls. In a rather compact nutshell, I'd tell you to pick up a copy if you like dystopians and yes, if you liked The Hunger Games. Something else that I should probably briefly mention is the fact that there is indeed bloodshed, guns, and fighting within Divergent. Not a horrifyingly large amount of it, but some. It's the sort of book that has you flipping pages until you reach the end, only to discover that you've read it rather quickly and that you weren't quite ready for it to be over. As such, I'd definitely recommend setting aside a decent amount of time to read Divergent, because quite frankly, if you read it before trying to sleep, you might catch yourself awake in the middle of the night reading with a flashlight/lamp because you were dying to know what happened next. I just won a copy of this book and have seen nothing but good reviews, so I can't wait to give it a go myself! I can't wait to read this book. I have seen great reviews but I feel bad moving it up on my TBR list when there are so many awesome books waiting. I think I am going to end up cheating and buy it this weekend.